And here’s an article from the New York Times: The Market Is Betting Trump Will Bring Higher Inflation and Interest Rates – “And on Wednesday, bond markets sent one signal loud and clear: The Trump years are likely to feature higher inflation and higher interest rates than have prevailed in recent years.” That is because during his election campaign he was backing out of foreign policy nation building war schemes, and that meant lots of monies would have dried up. President Obama continued the sham economic war policy and Hillary Clinton knew that she also would have to if elected; and what Trump was saying during the election campaign was not realistic with how the financial markets operate. And if Trump was to keep his promise about abandoning foreign wars and put America first (the people’s America), then he was not acting presidential. And that’s the reason why the corporate media gave him such a difficult time and will continue to do so if he decides not to follow the war path – hiding the collapsing US economy from the people. And much of the financial markets in the West have become usurious into the realm of speculation, thief, etc. And economists who are aware knows that President Trump is not properly informed in this area and will have to be quickly updated that different rules (like fearmongering, war, hype, speculation, etc.) now drive major areas of the financial market. BATTLEFORWORLD – Panic ending dates: April 29, 2017, August 15, 2017: Excitement, fanfare – hooray!!! The fearmongering has paid-off. Enough funds have been raised from the North Korean nuclear war fearmongering – for the United States government budget, but only for couple months. You can all go back to sleep now until the next fear drama. BATTLEFORWORLD – May 8, 2017: Another Kim Jong-un media showdown is being planned. The fearmongering is about him developing space capability to destroy United States Satellites with EMP (electro-magnetic pulse). 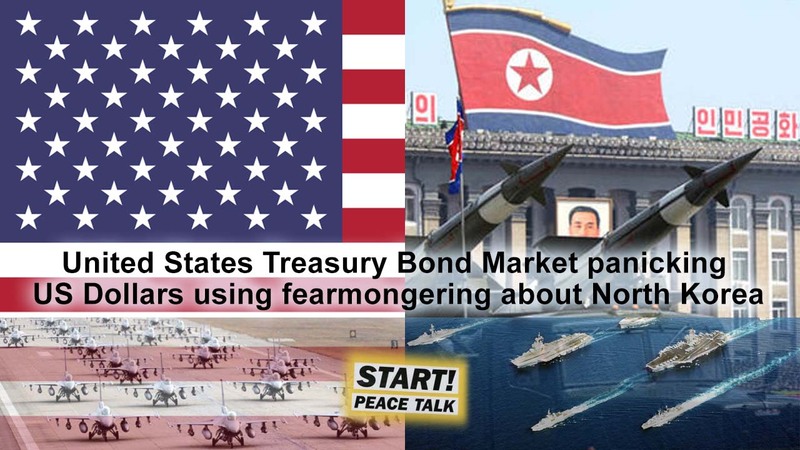 SPUTNIKNEWS – August 1, 2017: The US media recently reported that Washington is “crafting a set of economic measures meant to punish China” for its inaction in stopping North Korea from building a nuclear weapon. Russian political analysts, however, explained what the real aim of the US is and how China could respond. SPUTNIKNEWS – August 12, 2017: Commenting on the stepping up of warmongering rhetoric between the United States, Russian Foreign Minister Sergei Lavrov said that the risk of a full-fledged war between Washington and Pyongyang is “very high,” warning, however, from whipping up hysteria. SPUTNIKNEWS – August 14, 2017: The situation around the nuclear issue of the Korean Peninsula is being played out like an internal policy map of the United States, Russian Foreign Ministry spokeswoman Maria Zakharova said. BATTLEFORWORLD – August 20, 2017: And the fear-mongering and the panicking of the public and the financial market continues. CNN and the Wall Street Journal are kicking off this latest edition of North Korea and Kim Jong-un scary-movie. Reading the articles from both Western media sources you will notice that they are sensationalized. But why? Is it to incite fear and panic in Western readers? This can only be interpreted as acts of Gewalt. Very shameful and sadistic. RT – August 23, 2017: Beijing has urged the US to drop the new batch of sanctions against Chinese companies and individuals, saying that the restrictions do not contribute to defusing the Korean standoff. The sanctions were imposed by the US Treasury on Tuesday (August 22). They affect 16 mainly Chinese and Russian individuals and companies over alleged “support of the North Korean regime” and assisting Pyongyang in its nuclear and ballistic missile programs in violation of UN Security Council resolutions. One of the Chinese companies hit by the new US sanctions, Dandong Rich Earth Trading Co., has firmly rejected the allegations of violating the UNSC resolutions. The US Treasury accused the company of purchasing vanadium ore from North Korea. “Against this deplorable backdrop, statements by US representatives about a desire to stabilize bilateral ties sound highly unconvincing,” Ryabkov said in a statement on Tuesday (August 22). SPUTNIKNEWS – October 27, 2017: Over 60 US representatives and senators have introduced a bill that would prevent US President Donald Trump from launching a preemptive attack on North Korea without securing Congressional approval beforehand. The bill would, however, make an exception if the strike was made to repel a sudden attack, to defend American allies in the region or to protect or rescue US personnel. Fifty-nine of the 61 co-sponsors are Democrats; only two Republican co-sponsors, Reps Thomas Massie (KY) and Walter Jones (NC), have signed on. The bicameral bill was authored by Conyers as well as Sen. Edward Markey (D-MA) — both US military veterans — with the 88-year-old Conyers being one of two Korean War veterans currently serving in Congress. “As a veteran of the Korean War, I am ashamed that our commander in chief is conducting himself in a reckless manner that endangers our troops stationed in South Korea and our regional allies,” Conyers said in the press release. Instead, the bill calls for Trump and the White House to pursue a diplomatic resolution to the current crisis on the Korean Peninsula, which has seen an increasingly tense series of military buildups and exercises, as well as North Korean missile and nuclear tests. The flames have been stoked by Trump’s belligerent rhetoric, such as when, in a speech before the UN General Assembly, he threatened to “totally destroy North Korea” if the communist country attacked the US or its allies. SPUTNIKNEWS – October 27, 2017: US Defense Secretary James Mattis played the role of diplomat during a trip to Thailand this week, calling for peace on the Korean Peninsula. “Do we have military options in defense if we’re attacked, [or if] our allies are attacked? Of course we do. But everyone is out for a peaceful resolution,” Mattis said Thursday. The US is not “rushing to war” with North Korea despite Pyongyang’s continued nuclear weapons and ballistic missile development programs, the Marine Corps general noted. North Korea conducted its six nuclear test this year and continues to refine its ballistic missile technology through a series of missile launches. Mattis met with Thai officials Thursday after attending a meeting with defense officials from the Association of Southeast Asian Nations (ASEAN) the day before, Agence France-Presse reports.